Panorama on the Florida Trail in Big Cypress. CLICK for interactive panoramic. Try it on your iPhone! Aerial panoramic view of a hardwood hammock in a sea of dwarf cypress! This three day, two night hike across most of Big Cypress National Preserve is one of the more intense trips for the adventurous South Florida hiker. Organized by Christopher Scott Boykin of the Big Cypress Chapter of the Florida Trail Association (FTA), this adventure covered about 33 miles through a variety of terrain. Starting at the Oasis Visitor Center on the south end and ending up at the Mile Marker 63 Rest Stop / Access Point, we hoofed, huffed and sweated along the Florida National Scenic Trail in complete awe and at times near total exhaustion. This is also one of those trips you remember and tell stories about! 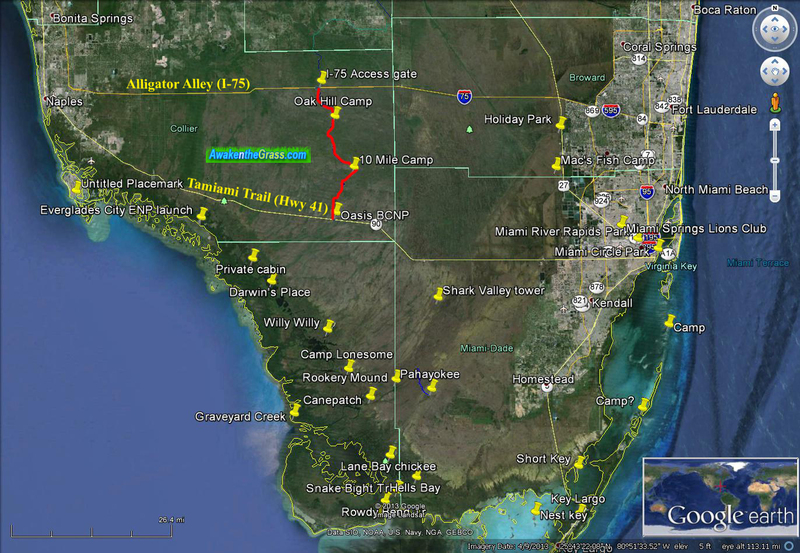 Satellite view of hike through Big Cypress in relation to South Florida. 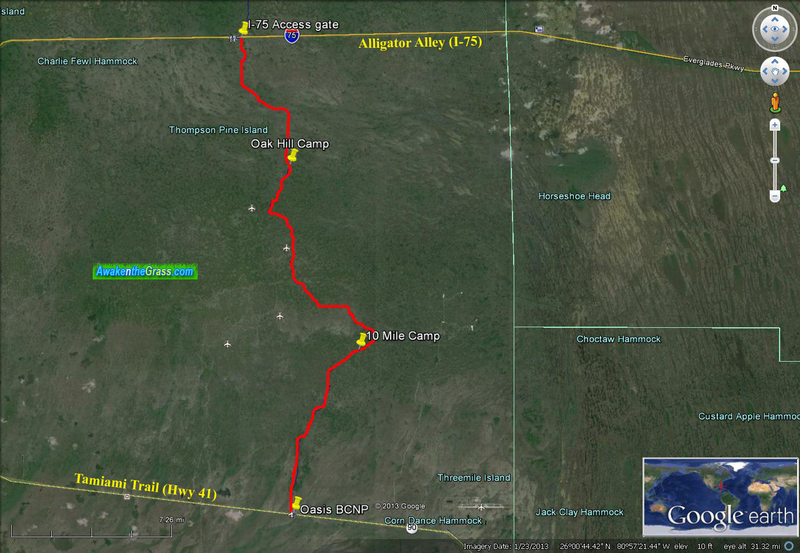 Click for detailed map of Big Cypress! The (new) start of the Florida National Scenic Trail is at the Oasis Visitor Center. Hiking along the perimeter of the Oasis compound airstrip. Only human hooves are allowed here! There’s no getting around mud and water in Big Cypress! The Florida Trail gets muddy and wet quickly. Most of the water is about ankle deep but can conceal deeper solution holes underneath! Everybody is packed up for the 3 day hike!! Elevated aerial view hiking into Big Cypress National Preserve. Aerial views along a very picturesque and wet section of the Florida National Scenic Trail in Big Cypress. Aerial dragon fly view of hikers on the Florida Trail in Big Cypress. Big Cypress snail in mud. Aerial view hiking through a Dwarf Cypress forest on the Florida Trail. Wet cypress forests give way to more flora along the higher ridges in Big Cypress. Hikers taking a break among the Slash Pine higher ground along the Florida Trail, a squirrel’s eye view. Nice place to take a break at 7 Mile Camp in Big Cypress. An FWC Swamp Buggy on patrol in Big Cypress National Preserve. As we detoured to check out some wreckage bits of an old downed small plane, we spotted (or rather did he?) an FWC Ranger / Law Enforcement on patrol in Big Cypress. He had a pretty sweet Swamp Buggy at his disposal! today’s FWC Ranger is packing some firepower! Small snake in Big Cypress. Cylinder head and valves of an airplane radial engine that crash landed here a long time ago. Sections of the Florida Trail show the underlying limestone bedrock. 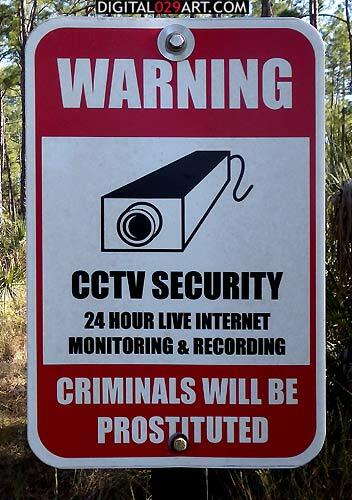 This is not a joke! There are many private camps all along this section of the Florida Scenic Trail. CLICK for more information! Winter sunlight filters beautifully through the epiphyte foliage! Hiking in Big Cypress – my pole and my cam, they comfort me! The beautiful sunlight triggered this black and white photography side trip..
Sunlight, trees & epiphytes in a cypress forest. The interesting geometric shapes of palm fronds pepper the landscape in the drier scrub-pine habitats. All green is monochrome, so is black and white! Shriveled dried leaves, texture and contour in black and white. Them bones in Big Cypress! Life, death and plaster in Big Cypress. Satellite view of 10 Mile Camp in Big Cypress. We arrived early at 10 Mile Camp, which is in a dry wooded Pine area. There’s only a sign and a fire pit ring, andcamping is dispersed radially around it! Afternoon at 10 Mile Camp. Bird’s eye view dispersed camping at 10 Mile Camp off the Florida Trail. Luckily there is a wet Cypress Dome nearby that provided us with all the fresh water we could use! Wet Cypress Dome next to 10 Mile Camp, the source of our water! Gathering drinking water and then filtering it is always one of the main activities in camp, especially on longer hikes like this one. Happy to be in camp. Trip organizer Christopher Scott Boykin at 10 Mile Camp. Sun setting, and temperature is dropping quickly! Dinner and camping stories in Big Cypress. This night was quite cool, dipping down to the low 30’s (F), and nearly freezing. This is cold for January even in South Florida! Cozy by the campfire at 10 Mile Camp. We kept that fire going as long as we could. Stars, smoke & trees in the cool Big Cypress night. My down sleeping bag worked well and kept me toasty all night long inside the inner sanctum of my old tent. Frosty morning dew on spiderwebs – it dipped to near freezing overnight! Slowly warming up in the early morning sun at 10 Mile Camp. For planning overnight trips, there is a weather reporting station nearby in Jerome, Florida. Trying to look happy since nobody froze overnight! The morning brought a beautiful new day and an early start for the projected 12 – 14 mile hike! Aerial view hikers in Big Cypress terrain. From above, and from below..
A worm’s eye view, looking straight up into the Cypress canopy. Hiking through a wet Dwarf Cypress forest in Big Cypress National Preserve. The hiking was fast paced as this would be the longest day for the group. The Florida Trail crosses and sometimes follows existing ORV tracks. It’s really neat, and a very special time to hike through Big Cypress on foot alone! However, the ORV option could be really useful to carry all the gear & supplies when engaged in other pursuits. Parts of the Florida Trail cross existing ORV trails in Big Cypress. An aerial bird’s eye view of a hardwood hammock in Big Cypress. Destination: Oak Hill Camp – a hardwood hammock in a sea of wet cypress! Satellite view of our next camp “Oak Hill” hammock, still miles away. Sun is setting, we are still hiking! As the sun was setting, we were still a couple of miles from camp. Heidi and Darryl hiking into the sunset. Approaching Oak Hill Camp in the darkness. Hiking through the Dwarf Cypress trail in the dark wasn’t altogether much different from daytime as the trail is mostly concealed under the water anyway. The fatigue from hiking all day through gnarly terrain becomes apparent at this point! Entry into Oak Hill Camp. Thankfully the Oak Hill Camp was already set & the fire was going when we arrived to re-join the group. I smelled the smoke from that fire a good distance away – it was the homing beacon! Owl’s eye view camping at Oak Hill Camp in Big Cypress. Oak Hill Camp is dry ground inside a hardwood hammock and typical of Big Cypress camping. Here I am chilling by the fire! What’s this? It’s an origami tea cup with a Jasmine Blooming Flower tea steeping. Thanks Christopher! This night was much warmer as forecast, with lows in the 50’s (F). Inside the inner sanctum of my tent. The new morning brought renewed energy and plenty of sunshine along with lots of water to pump for the day ahead! A Big Cypress hiking panorama on the Florida Trail. Black and White photography from Big Cypress. Big Cypress still looks much as it did in the past. It hasn’t been as radically altered by human (mis)deeds as the Everglades to the south! Walking in a Winter Wonderland, Big Cypress edition, January 2014. Being at the tail end of the group has it’s privileges! M is for ? MORE! A hiker dwarfed in a Dwarf Cypress forest! My shoes will look like new after a wash – believe it or not! Miles and miles to go before we sleep .. thank you Robert Frost! Taking a break in another hardwood hammock a few miles south of I-75. Sometimes you’ve just got to have some chocolate! What an OUTRAGE! Did the trick, thanks Darryl ! Cypress and Spanish Moss under a blue sky in Big Cypress. As we neared I-75, the constant traffic sounds like a running stream in the distance! Flying over an ORV track near I-75. You can see a tower straight ahead. Which is the Zoo, inside or outside the gates ? New Big Cypress access parking lot being built at the Mile Marker 63 Access Point gate. The mailbox at the trail head off I-75. The path of the Florida Trail totalled about 33 miles! I’d like to express a BIG thanks to the Big Cypress Chapter of the FTA & Christopher Scott Boykin for the trip and for bringing South Floridians face to face with our unique backyard wilderness! Also special THANKS to Ryan Westberry for shuttling everybody back to Oasis, much appreciated!